In a series of posts this week we will highlight the mediterranean climate that characterizes California and 4 other regions of the world. Mediterranean climates are unique from any other throughout the world. They are loved by gardeners for their relatively moderate temperate temperatures with more or less mild extremes in the winter or summer. As a growing environment for plants they provide a good place to grow many differing types of plants from a variety of different climates and locations throughout the world. The mediterranean climate is characterized mainly by its unique rainfall patterns, receiving little or no rain in the summer, abruptly contrasted by wet winters. Specifically these climates occur exclusively between 30 and 45 degrees in latitude throughout the globe, and tend to predominate on the western edges of these areas. The mediterranean climate plays host to some of the most interesting and uniquely adapted plants in the world. The five areas considered mediterranean climates are southwest and southern Australia, coastal and central California, central Chile, the majority of the Mediterranean basin bordering the Mediterranean itself, and the southwestern tip of South Africa. A diverse and interesting host of plants grow in these climates, even though the total area of the mediterranean climates throughout the world is only approximately two percent. 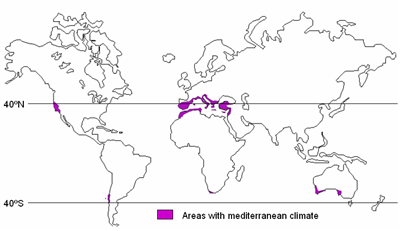 The mediterranean climate results from a number of unique, important and complex factors. Almost all the areas of the climate occur sandwiched in between a strong maritime influence and a defining band of mountains (except Australia). Almost all these areas also have predominately western orientation, the result of which is often a high pressure accumulation that is a major contributing factor to the climate’s dry summers. In addition, this western orientation ensures exposure to the prevailing western winds of the world, which extends the effects of sea, moderating temperatures, and making temperature extremes characteristic of interior continental areas rare. The areas also are subject to cold-water currents that help to moderate temperatures during both the warm and cool seasons. Specifically, these currents are the California current in eastern pacific, the Humboldt current in the south eastern part of the pacific, west of Chile, the Bengueh current in the Atlantic ocean off the western part of South Africa, the Canaries current in the Atlantic off of Morocco and Portugal, and the warm Leewin current in the southern Pacific ocean off the western coast of Southern Australia. It is these currents that also help moderate temperatures, and ultimately play a role in precipitation patterns. Precipitation patterns for the various regions vary, however for the majority of locations the average rainfall is between 30 and 45 inches. Areas receiving more or less rainfall usually lie on the edge of a mediterranean region or are influenced by increased or decreased precipitation due to elevation differences. Characteristically, these areas rarely receive summer moisture. This trait is exaggerated in the interior portions of the climate. As one travels toward the ocean, the greater influence often provides moisture in the form of frequent summer fog. Plants adapted to coastal mediterranean conditions may have completely different characteristics and tolerances from those found further inland. Mediterranean plants as a group have developed several unique adaptations that help them do well in a climate characterized by a long dry season. Plants may develop a shrubby habit of growth, with tough adaptive leaves. This helps to conserve water during the summer months. Other leaf adaptations include specialized stomata that prevent excessive transpiration, and extensive hairs or toment that help the plant deal with arid conditions. Often plants will not go deciduous because of the energy, nutrients and water needed to put on new growth every year. Plants may also develop a period of inactivity or dormancy, or may even go deciduous in the summer as a response to drought or extensively dry conditions. In addition, plants may develop deep spreading roots to help gather as much moisture as possible. Still other plants develop an annual habit of growth that helps them to deal with changing climatic conditions. Some plants are even more highly specialized. In chaparral and other similar plant communities plants may develop specialized seeds that open only under intense heat as a response to frequent fires in these areas. Although as a group the mediterranean plants are highly adaptive this does not mean that all plants possess these traits, or even require them. Again, it is important to remember that there are fairly distinct differences between the immediate coastal areas and the inland mediterranean areas. Just because a plant is mediterranean in origin does not necessarily mean that it will survive or thrive if taken out of its particular niche. 1. Brenzel, Kathleen Norris, ed. Sunset Western Garden Book. Menlo Park, CA:Sunset. 2001. 2. Dallman, Peter R. Plant Life in the Worlds Mediterranean Climates, Berkeley: University of California press. 1997. 3. Hawkins, Lester. “Gardener’s Guide to Mediterranean Climates.” Pacific Horticulture. Winter 1980-81: 21+. 4. Turner Jr., R.G. Ed. Botanica. Barnes & Noble. 3rd ed. 1999.